The technology of electroerosive machining with a shaped tool electrode utilizes thermal energy when removing the material. It results from the continuous repetitive electrical discharges of high intensity between the workpiece and a tool electrode in the presence of a dielectric fluid. The gradual removal (erosion) of metal particles occurs both from the workpiece and the tool electrode, in response to the periodically repeated electric discharges. There is, however, important to emphasize that it is only desirable material removal of metal particles from the workpiece. The removal of metal particles from the tool electrode is considered to be a negative accompanying phenomenon in the case of electro-erosion machining because it causes wear. Its scope can be fairly accurately quantified using a pointer relative electrode wear. 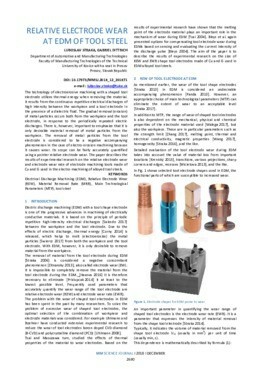 The paper describes the results of experimental research on the relative electrode wear and electrode wear rate of electrode machining tools made of Cu and G used in the electro-machining of alloyed tool steels. "ANTON PANDA, LUDMILA NOVAKOVA-MARCINCINOVA, EMA NOVAKOVA-MARCINCINOVA, JAN DUPLA, TADEUSZ ZABOROWSKI"